I am in Sabie, South Africa for a month, visiting the Vernon Grannies’ project of Sitabogogo, as African gogos (Zulu for “grandmothers”) gather for their morning activities. Today a physiotherapist is leading them through weekly exercises, and a dietician speaks to them about calcium rich foods for strong bone development. I’m pleased to see several gogos ask the dietician a number of earnest questions. Today, also, the two Belgian women cook up a giant pot of soup, chopping onions, butternut, potatoes, leeks and tomatoes into a huge pot with a dried grain and bean mix, while I listen intently to their remarkable story. A few years back Vicky Bryant and Myriam Sarlette both lived in the town of Thimister, near the city of Liege in Belgium. They each felt they’d had good lives and they now wanted to devote their energies to helping disadvantaged people, particularly women they could relate to – grandmothers. Vicky was a former English teacher and department head at her school. Although born in South Africa, she immigrated to Belgium in 1980 and had made it her home for the last 30 years, where she worked, raised four children and now has a grandchild. Myriam is a Belgian national who worked as a librarian, and more specifically as a documentist and researcher. She, too, has raised four children. They first met when their children were young and played together after school, the start of a lifelong liaison. Fast forward to the 21st century. Both women were now divorced, and in 2008 Vicky and Myriam joined together with a shared goal. They set down on paper their vision under the name of Vital Beat. Their stated purpose was “To help grandmothers bear the burden of the AIDS related epidemic and its consequences, in the spirit of Christian care”. In 2010 they shifted from a vision on paper to making it a reality, and began an earnest internet search of non-government organizations and charities. At the same time a friend gave them a brochure about the Stephen Lewis Foundation’s “Grandmothers Campaign” in Canada. So, while googling that group from Belgium, one of their hits led to Grannies à Gogo: the Vernon – South Africa Connection. A surprising side effect was that Vicky’s debilitating fibromyalgia and repetitive strain syndrome began to heal after they had made the decision to emigrate to South Africa. And two weeks after arrival in South Africa she was pain-free. They arrived in Sabie in March, 2011 and immediately became involved with Sitabogogo. Myriam’s talents of fine needlework, cross-stitch embroidery, crochet, and knitting, and Vicky’s as an artist and educator were a valuable asset with the gogos’ activities. Before long both women were serving on the Board of Directors for the organization. 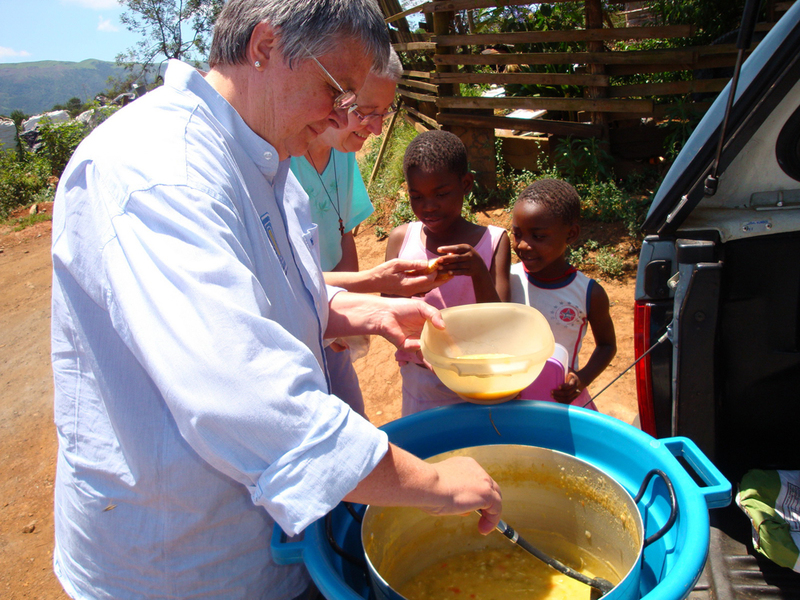 Vicky Bryant (left), volunteer administrator, and assistant Myriam distribute soup and bread on the backroads of Sabie, South Africa. The tiny kitchen is now filled with fresh vegetable soup aroma as Vicky and Myriam heave-ho the heavy pot into the back of a small truck. I hop in with them as they drive out on a dirt trail into what I can only describe as the underbelly of the township – ramshackle huts and garbage strewn roadsides. We stop near the town dump and gradually people appear, including some who have been scavenging in the dump. Some carry their own cups, and for others there are donated yogurt containers of various sizes. Vicky ladles the soup from the tailgate of the truck while Myriam distributes bread. This is a project they do twice per week, and they’re now getting to know a few by name. As I listen to this story of the desire to help the disadvantaged, it reminds me of a change in consciousness that is being seen more and more amongst affluent nations. In particular my mind turns to the large contingent of Vernon and area women who work hard at fundraising and have great camaraderie as they do so. I resolve to share stories and photos with the gogos about the Vernon Grannies’ projects, so they understand more about our work on their behalf.